In the 27th century, the Transgenic virus has redefined what it means to be human. The exiles of Earth’s Outer Colonies have evolved distinct genetic advantages over their ancestors, and they are coming home to claim their birthright. Commander Jantine leads an infiltration force of soldiers, scientists, and engineers on a mission to establish a new colony on the planet that cast them forth so many years before. Lieutenant Mira Harlan of the System Defense Force is part of a clandestine fleet stationed just outside Earth’s orbit. She doesn’t know it yet, but there is a priceless secret onboard her shipa young girl whose genetic code might unlock the mysteries of the Transgenic virus. When Jantine and her crew emerge violently from hyperspace, they collide with a centuries-old conflict that could tear the home system apart . . . unless Harlan can master the secrets of her priceless cargo before even her own humanity becomes a casualty of war. Scott James Magner is a writer, editor, designer, developer, and world builder. His work appears in tabletop and online role-playing games (most notably Dungeons and Dragons, AION, and TERA), card games, miniatures games and board games. He has a passion for movies and classic science fiction, and spends his days tweaking and twisting new worlds. 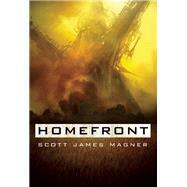 Homefront is his first novel.